Retirement Daze: The very eye-dea! For some reason, after years with progressive lenses, I recently decided to give the old-fashioned bifocals a try. I guess the main reason was that the progressives worked for distance, for seeing our vehicle’s dashboard and usually were okay for the computer, but for serious reading and close-up work, I would take my glasses off or do the tilt-and-look-over-my-glasses maneuver. Husband Walter went with me Friday afternoon to pick them up. He seemed to think he had done his duty by accompanying me earlier to pick out frames. I am so nearsighted that if I position myself close enough to see the frames, I really only see my nose. Not very helpful for making a choice of something that will be a part of my face except at bath time and bedtime. Hubby was a trooper and helped me pick out frames. Back to why a companion was necessary. After years of getting new extremely thick glasses, I knew the possibility existed that once I put them on, I would be drunk. Could be I have a slow brain, reluctant to adjust to the changes in shape and strength, even subtle changes. Sure enough, the changes, especially that line where the bifocals begin, were and still are an instant flusterator. Okay, computer, I know that isn’t a word, but that is the way I feel. Walter drove home while I practiced looking at things. As long as I sit still and don’t move my head, my distance and reading vision is improved over my old glasses. When I move, however, disaster lurks, either from my surroundings whizzing around or from inadvertently looking through THE LINE. 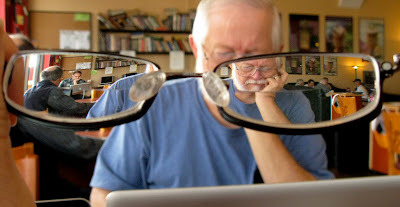 I also keep forgetting and looking over the top of the glasses instead of using the bifocals for reading. I can tell adjustment is occurring, although slowly. I expect my brain will fully adjust at some point. One other whine: Sitting on the sofa in front of the fireplace to check email and to blog may be a thing of the past. Evidently the distance from eye to screen in that situation is a no-see zone. With a few clicks I can enlarge most Web pages to a readable size, but others defy easy enlarging by this technologically challenged blogger. Any advice from experienced bifocal-wearers is welcomed! The upside: Walter likes the new look. I mean he REALLY likes the new look. Enjoyed your creative photo. I too am extremely near sighted and wear progressive lenses. Problem is, my near sightedness is not as good as it used to be. And, I am developing cataracts. Bummer. Good luck with your new glasses. Ok, can I relate to you big time! I have worn glasses since 12 (50 years now) and in my 30's went to contacts which ended when the need became evident for the progressive lenses. With progressive lenses I had the same concerns you named; taking them off to read books, struggling with the computer. Big problem since I worked on the computer 15 or more hours a day. What my eye doctor recommended about 7 years ago for me has turned out to be a huge blessing. I still have the progressive lenses for driving, normal wear around the house but they suggested a second pair of glasses called "office glasses"; NOT computer glasses. Big difference I guess. 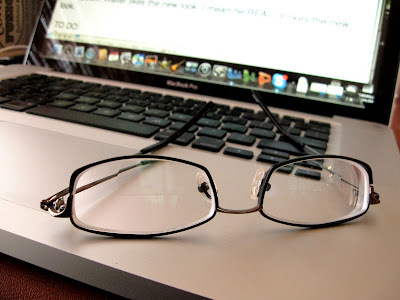 With these office glasses I can see great on the computer, use them to read and it has made a huge difference. These two pair of glasses have kept me from going to the bifocals. I had never heard of "office glasses" but they work like magic. Good luck; getting new glasses makes me sway and swerve when walking, too, and makes the ground seem like it is coming up. Oh, my, what a trying and dizzying time you are having! I need tri-focals, the third part is for mid range (which is computer). 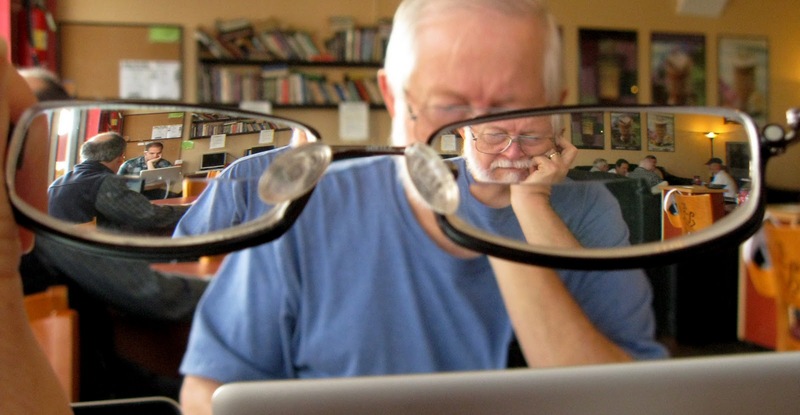 Bi-focals seem to do well for close range and far range, but the mid seems to lose out. Since I don't want tri-focals, I had them test me for computer use and they made me computer glasses. Then I use bi-focals for everything else. I do love your pictures! Hey, y'all are the fabulous five! Your comments have decreased my frustration level. Plus Julie and Ginny both are operating with alternatives that are working for them. There's hope! Thanks for the encouragement on glasses and on photography!